SCE president Kaz Hirai says that the PlayStation Network has more users than either of its rivals. 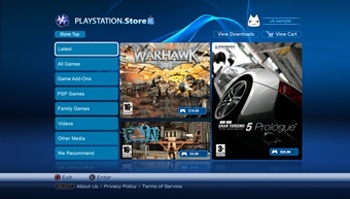 According to Sony's figures, 80% of the 38 million PS3s sold globally to date are connected to PSN, which puts the total at over 30 million, around five million more than Xbox Live. Hirai said that the company's target was to have every single PS3 online in the future. Similar figures were reported by market research firm The Diffusion Group back in April, which put the total at 78% after surveying 2000 broadband users in the U.S. The PS3's built-in wireless adaptor - something that the Xbox 360 lacked until recently - is likely to be a major contributing factor, as the PS3 can connect to Wi-Fi without the need to buy any additional hardware. Hirai said that Sony is likely to meet its sales target of 15 million consoles by March 2011, so the number of PSN users will certainly rise. He added that there were no plans to merge PSN with Sony's Qriocity network, which allows the streaming of movies, and soon music, to certain Bravia TVs and Sony Blu-Ray players, keeping PSN's various movie solutions separate.